I am trying to scrap our backyard renovation progress, this is my most recent LO, the photo was taken after James spread out our gravel. I used Seeds of Tomorrow by Marshmella Designs, which can be found at Digiridoo Scraps. This month's free Collab, with any purchase at Digiridoo is this awesome kit, Tree Hugger. It was the perfect kit for some tree climbing photos I took before a storm blew our lovely tree down :( I also used Color with Caryn's DSO challenge template, which you can grab here for free if you want to participate. Linnie of Chocolate Geranium Digital Designs gathered some wonderful Digiridoo designers to create a wonderful charity kit, Red Nose Day fun-tastic kit all profist raised from the sale of this kit goes to SIDS and Kids. Help raise money to save babies and educate expectant mums on safe sleep practices for bub to reduce the risk of SIDS. This great kit contains 42 papers, 156 Elements, 1 8x8 brag book and 1 12x12 Layered Template all for only $5! Don't you just love those vibrant colours and for such a great price and worthy cause how can you pass it up? I've just used it for a belly LO and I really love how it turned out! Plus, If you buy anything from the Digiridoo shop during the month of July you will get the Gardenology mega kit FREE! Surprisingly, I've managed to create a LO with this too (though it is gorgeous to work with)! I also used a template from Color with Caryn's July template challenge over at DSO. I was inspired by the Layer it Up Challenge over at DRS, which is being hosted by the lovely Kristie of Snippets Inc. 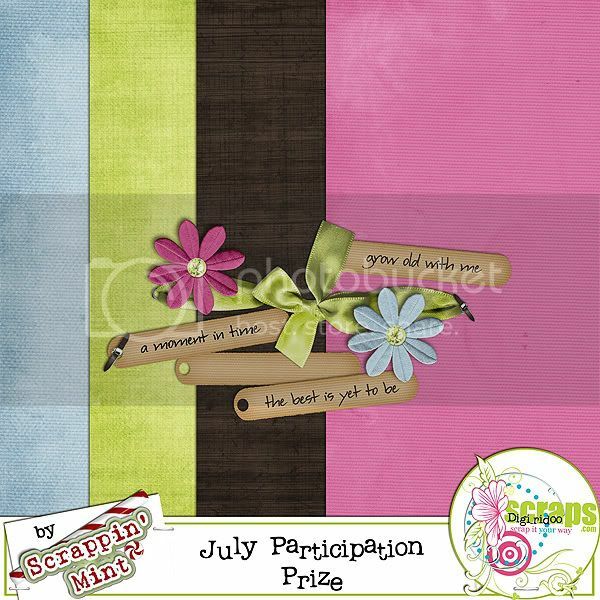 If you join us, you will get this PP from Scrappin' Mint, which coordinates with all the other PPs for July, so the more challenges you participate in, the more you'll have in your kit! If you're loving the papers and glitters I used on my LO, you'll be please to know Caryn is going to have a sale to celebrate the 4th of July. Be sure to pop over to her stores to grab yourself a bargain!